The Africanized honey bee (Apis mellifera scutellata) is a subspecies of the western honey bee (Apis mellifera Linnaeus). The subspecies is the result of the introduction of the non-native African honey bee (Apis mellifera scutellata) to South America in the 1950s. 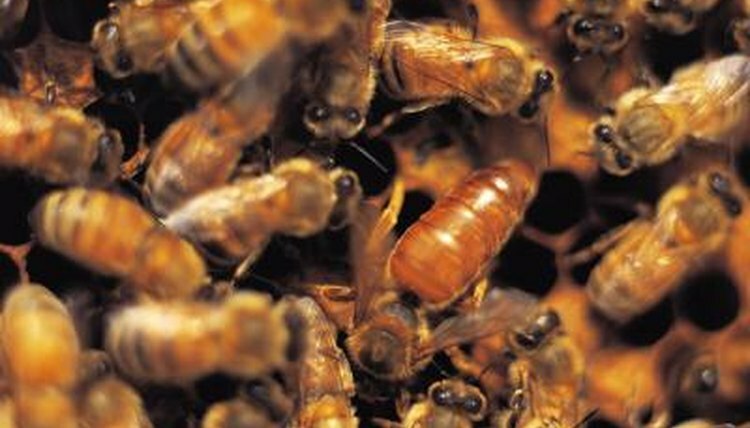 The term "Africanized" refers exclusively to the Apis mellifera scutellata in their introduced range. These bees are often called "killer bees" due to their highly aggressive behavior. They are almost identical in appearance to other honey bee species, which display few physical variations between one another. Honey bees are anatomically typical of all insects. The body is split into three sections, the head, thorax and abdomen. They have two pairs of wings, antennae and three pairs of legs. They are distinct from bumble bees, which are larger and have a rounder body shape with a less defined mid-section. Honey bees, regardless of subspecies, live in areas rich with pollinating plants. To the untrained eye, Africanized honey bees are no different than non-Africanized honey bees. Only under a microscope, do minor differences become apparent. Wing venation patterns, measured by observing the distribution of veins on the surface of the wings, are the reliable visible indicators of differentiation at the subspecific level. Beyond this, morphometric analysis -- a process which involves in depth study and comparison of numerous bees belonging to known colonies -- is the best way to determine whether a single bee is Africanized of not. All honey bees display the distinctive yellow and black warning coloration. However, some non-honey-producing species display different variations of the well known yellow and black striped pattern. This is a key feature of the honey bee’s appearance and serves to warn would-be predators that attempting to eat the honey bee would result in a painful sting. An isolated Africanized honey bee, in practical terms, is barely any different to a non-Africanized honey bee. This is because the most important differences between Africanized and non-Africanized honey bees are behavioral and those behavioral differences are linked to swarming. Africanized honey bees are more likely to attack and chase a perceived threat to the nest and will do so for a long distance. They also defend a larger radius around the nest, making them more likely to attack innocent passers-by with no intention of disturbing them. They swarm in greater numbers, meaning attacks from Africanized honey bees are typically more medically serious than attacks from the smaller swarm sizes of non-Africanized honey bees, hence the “killer” tag.